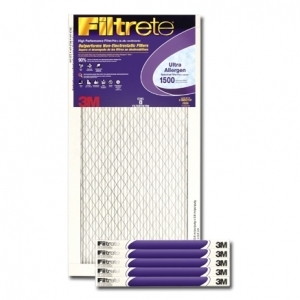 The Filtrete® Ultra Allergen Reduction Filter carries a 3M Microparticle Performance Rating (MPR) of 1500 - roughly equivalent to a MERV 12 rating. *This filter should be changed at least every 3 months. Certain conditions in your home will significantly add particles to the air - this will cause the filter to capture more particles, shortening it's life to less than 3 months. These conditions would include: dirty ductwork, pets, construction work, sanding projects, tobacco smoke, burning candles, fireplaces and wood-burning stoves.